This post may contain affiliate links meaning if you buy from them, I will make a few pennies, at no cost to you. See disclosure here. Feta, artichoke, olives, and tomatoes make this the perfect summer pasta salad. Or you can eat it year round, like I do. Update 5/28/13: I first posted this recipe in June of 2011 (see the crappy cell phone pic at the bottom). It deserved to be rephotographed because it’s one my favorite pasta salads. It’s light and great (for me) as a main dish. It’s perfect for a picnic/BBQ since there’s no mayo in it that you have to worry about keeping cool. I first had this at a function I went to with my mom & liked it so much that I tracked down the host and got the recipe. I think next time I’ll add some some dried tomatoes, too. This simple pasta salad filled with feta, artichoke hearts, olives, and tomatoes is great all year round! Bring a large pot of salted water to boil. Add the pasta and cook until tender. Drain and set aside. 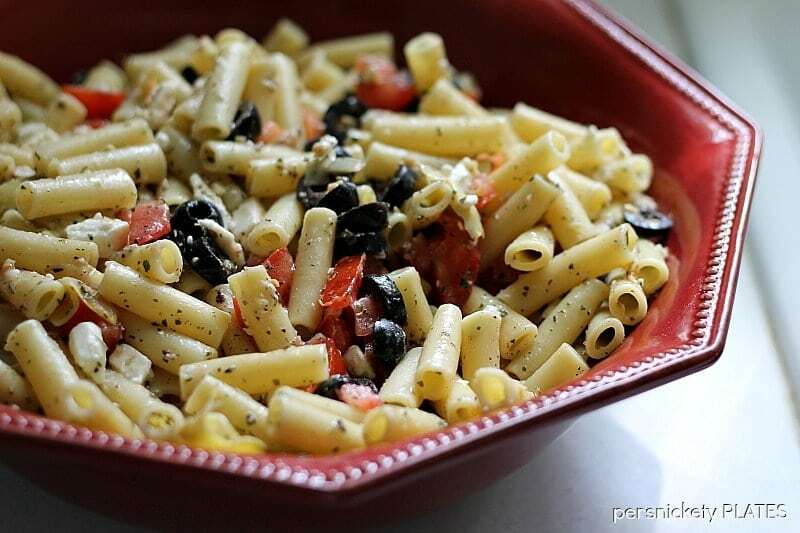 Lightly coat the pasta with olive oil. Add the packet of dry ranch dressing and stir. Add the tomatoes, onion, artichokes, and olives. Toss. Add in the feta cheese and Italian seasoning and toss again. If pasta gets too dry, add a little more olive oil and re-toss. Tried this recipe?Tag @melissa_pplates or tag #persnicketyplates! Never miss a delicious dish, get our free newsletter today! 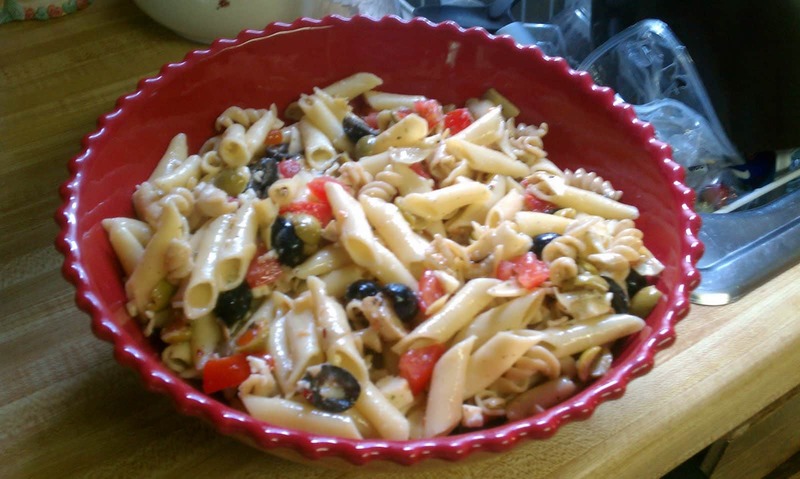 Pasta salad is a favorite summer side in our house. now I have a new one to make instead of the same one every time. YUM! I'm a recipe collector and creator. I love to share easy-to-make recipes without fancypants ingredients that the whole family will love. Melissa Williams/Persnickety Plates is a participant in the Amazon Services LLC Associates Program, an affiliate advertising program designed to provide a means for sites to earn advertising fees by advertising and linking to Amazon.com.